If you haven’t taken a close look at Quora yet, you should. All signs point to it becoming the next mighty social network, joining the ranks of Twitter, LinkedIn and Facebook. Quora is a platform for asking and answering questions. But its social networking features make it more powerful and engaging than StackExchange. And its focus on Q&A make it more elegant than similar features built into LinkedIn and Facebook. Why Is Quora a Big Deal? Quora strikes a good balance between contributing and consuming content that is relevant to you. It accomplishes this by allowing you to follow individuals, topics and even specific questions that you find interesting. Its community features allow discussion participants to vote up or down answers, so that the most useful content is likely to receive your attention. And, it lets you directly ask questions that are on your mind. Lastly, Quora includes an element of a wiki, allowing discussion participants to recommend revisions to existing Quora content. Quora is d’Artagnan to the three social networking musketeers: Twitter, LinkedIn and Facebook. How do mint.com and similar websites avoid storing passwords in plain text? If I want to find malware on modern OS X systems that persists through a reboot, should I look farther than launchd? How does Chase verify the authenticity of checks deposited via photos from its iPhone app? How prevalent is corporate espionage in the Silicon Valley? Of course, one person’s interesting is another person’s boring. That’s why social networking features of a Q&A site are so important, so you get to see and follow the discussions that match your objectives and expertise. 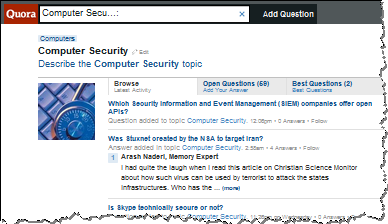 Use the site’s powerful search feature to locate topics and questions that interest you. Then, browse through the answers and follow the people whose questions or answers you find particularly insightful. Here are a few topics that might be of interest to information security people: Network Security, Software Security, Data Security, Web Security, Cloud Security, Information Security, PCI Security Standard, Computer Security. Like with all on-line social networking activities, be mindful of what you reveal about yourself when participating in on-line discussions or electing to follow topics, questions and people. Much (most?) of what you do on Quora is public and can indexable by Google. Case point: my Quora profile provides a comprehensive listing of my activities on the site. I recommend treating everything you do on social networking sites such as Quora public. How Does Quora Compare the Other Social Networking Sites? I see Twitter as a cocktail party, where you can drift from group to group, overhearing bits of conversations and sharing your insights. LinkedIn, to me, is a social reception where people try to dress up more nicely than on Twitter. No suit required, but at least business casual. I think of Facebook as a family holiday gathering or maybe a school reunion. You know most of the people, though haven’t kept on touch with then for some time, so you are glad to catch up on their latest news. Quora feels like a panel discussion at your favorite conference, where you are both the panelist and the audience. Plus, it’s a Q&A session that you get to moderate. On a related note, if you’re just getting to know Twitter, take a look at my post Joining the Information Security Community on Twitter.